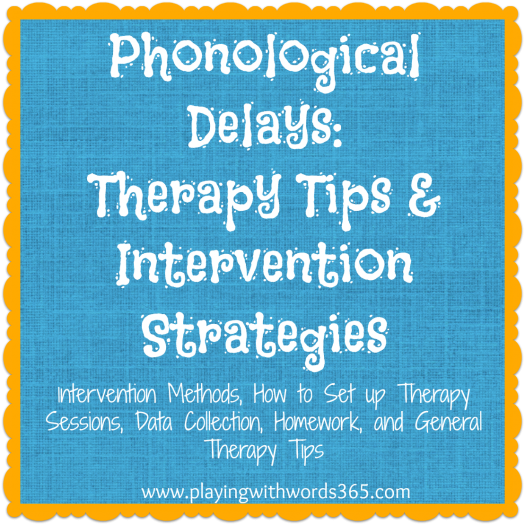 Part One: Phonological Delays: Don’t Treat Them Like Articulation! In my LAST POST I gave a quick review on the most common phonological approaches to intervention. I mentioned there that I primarily use the Cycles Approach developed my Barbara Williams Hodson along with minimal pairs. Why? Well when I started working with preschoolers I realized I needed to go back and review phonology and treatment methods. I asked questions on SpeakingOfSpeech.com and a fellow SLP Dawn was a huge advocate of the Cycles approach. She had FREE outlines on how to implement the methods as well. She was kind enough to send me her documents (you can now download them on her site HERE) and as she suggested I also ordered Barbara Hodson’s Book (LINK). After doing some additional research, I started using the Cycles approach and it worked! However…some kids were still having some difficulties with fronting/backing once we had done a couple cycles and with those children, I sometimes use minimal pairs within my cycles. I have personally found this method of combining the two methods beneficial for some children with certain error patterns. Currently, I am not working in the schools as I stay home with my babies and just work with a few private clients 1:1. However, I worked in the schools for several years (both full time and then part time) before resigning all together to stay home, so I will share how I set up my group sessions in the schools as I know the majority of the SLPs reading this work in schools. One year I worked at a preschool center that had themes already planned, so that year I went along with their themes. Some included Zoo animals, Transportation, Community helpers, etc. I know not all school SLPs can do lessons based on holiday themes also, though I have never had any issues with this. GAMES & CRAFTS: Once I have my theme set up for the month, I then plan out a bunch of activities that go along with the theme. I mostly use games and easy and inexpensive crafts/art. Sometimes the games don’t always match the “theme” but I try to when I can. I also try very hard to find activities that be used across as many groups as possible across age levels. When my caseload was preschool to 3rd grade. When my caseload was split preschool and middle school (4th-8th) this was not the case. So for those years, I planned out activities for preschool and then activities for the 4th-8th graders. When my caseload was K-5th I planned K-3rd and then 4th & 5th. The way I do my sessions is pretty easy. I have the kids say so many words, and then they get a turn at a game or a part of a craft to glue on. It is, of course, important to make sure that you make the session about the WORDS you are practicing and not about the GAME/CRAFT. The game or craft is just positive reinforcement for the child practicing. Because I use Cycles, I do not take data in the way I would for standard articulation therapy. I am not looking for the % correct, because that is not how cycles works. What I do, is keep track of how many CORRECT productions I get from a child per session. I also keep track of my cycles on my CYCLES DATA SHEET so I stay organized. Then, every few weeks I do a quick speech sample and I probe. I then take data on % correct in conversation and in elicited words (usually just 10) to see how the child is generalizing. Try to keep your groups SMALL. I know, I know…easier said than done. With preschoolers, I keep my groups at 2, with 3 only when absolutely I have no other choice. I also group my phonological kids together whenever I can (again….easier said then done, I know, but your kids will make better progress so see what you can do). My goal is to get 75-150 CORRECT productions per child per each 30 minute session. And this is very doable for groups of 2-3 in preschool and is even possible for larger groups of older children. This is, of course, after the child is stimulable for the sound. I do a combination of drill with naturalistic opportunities within the session. TRY to get the kids to practice at home. I know it can be hard. But it will be worth it. HOWEVER do not send home homework unless the child can produce the sound with little to no cuing, and be sure to give the parents any cues you can. More about homework below. Once I have worked with the child and he/she is able to produce the new sound/sound pattern with little to no cuing needed from me, I start to send home homework. Over the years I have done homework in a few different ways, but the bottom line is that I want the child to say their words 100-150 times everyday. Which, only take a few minutes. Sometimes I send home cards with games they can play, sometimes I send home a cut-and-paste worksheet for them to do (usually from THIS book). I also have had the child see how many words they can say correctly in 2 minutes and then record that number on a sheet and bring it to me and we have a little competition. This is great for 4.5 years and older usually. I also will send home auditory bombardment activities and recommended stories that incorporate their target sounds for parents to read at home. I think that is it! I find that it often takes 1 to 1.5 years to get a moderately delayed child dismissed, then add/subtract for severity. Some kids are faster, some are slower. There are many factors that contribute to the timeframe like parent involvement, homework completion, the type of processes used (velars can be hard ones to treat), how many children in a group, child’s motivation and temperament, etc. Hope you all have enjoyed this series! Please let know what you think. What a wonderful series! Thank you for all the information. I am so glad to have stumbled onto your site. I am not an SLP, though I am very interested in the information you are providing as I am a reading specialist specializing in word study and the order in which students acquire their knowledge of words and the order in which they learn how to spell them. This has led me to a lot of phonemic awareness inquiry and how kids hear sounds, difficulties, interventions, etc. as well as they way sounds are articulated, felt, and identified by children as they write. It all started when I figured out why a child would write “drive” JRIV. And then my curiosity snowballed. Please continue to consider that I may not understand all the lingo, but I will read very closely to gain all of your wisdom. Thanks so much for this site! hi Anna, WELCOME! I hope you find my site useful. Please let me know if you have any questions, I am happy to help! Thanks so much for this valuable resource. Will refer to it often I’m sure! Hi Katie! Thanks for all of the great information. I’m in my fifth year of being a school SLP and just started using Cycles this year when a student I’ve had for a few years was not making progress with drill work (still reducing blends and deleting final sounds). I actually used Dawn’s site and information to get started. Would you mind to walk me through a typical 30-minute session? I read in Dawn’s info that it should include auditory bombardment and of course the target words. Sounds like you recommend also doing some drill work within the session to get 75-150 correct productions. Do you drill some words then do your activity? If I’m working on /sm/, how would a typical session go? Thanks so much! Yes, I start the session with auditory bombardment (I think I failed to mention that in my posts!). I then gather up the target words for the students, and we start a game of some sort, and then we play the game as we drill drill drill. I do the drill within the activity. They say the words so many times, and then they get a turn at the game. Does that make sense? You only work on words, correct? Do you always provide the student with a verbal model? How do you document progress in the school setting if the child is consistently producing the target sounds let’s say 90 productions per session, but is not yet generalizing them into conversation and they are unable to produce it correctly when elicited? For auditory bombardment, do you read a list of words only or will you use those words in sentences? Thanks for your help!! Well, here it is 2014 and I’ve just discovered your wonderful teaching on Phonology. I’m definitely going to purchase Hodson’s newer Phono. book (I have the one from the dinosaur age…). Until it comes, would you be able to tell me a bit about syllable deletion? I have a 3 yr old student that is virtually unintelligible. Am I just going for the “syllableness” of the words and not the other processes? Thank you so much for this series. I have been feeling so discouraged because I also felt like I left grad school with some remaining confusion about phonology!! It REALLY helps to have all of this information in one place, and you did a wonderful job of explaining it. I’m so glad I found this series!! There’s a reason your posts were required reading back in undergrad! Now I’m in my CF placement in a school, and your site’s still one of my first stops for additional guidance and resources. Thank you so much for sharing all that you do! Wow, thank you so much for this! I’m so glad mt site has helped you!